Find hotel near Ankamall Alisveris Merkez .. 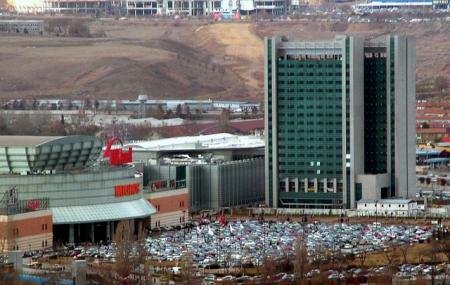 This is the second largest mall in Turkey and the largest mall in Ankara, this shopping centre covering an area of about 1890,000 square feet. Restaurants, cafes and variety of shops make it a popular hang-out. How popular is Ankamall Alisveris Merkezi? People normally club together Ataturk Mausoleum Or AnitKabir and Hamamonu Restored Area while planning their visit to Ankamall Alisveris Merkezi. It's a big 4-story mall next to the Crown Plaza Hotel with a number of familiar US companies like Dockers, Victoria Secret, as well as local brands. Some shops sell medium to high end items. There's a huge food court with almost all the US fast food like McDonald's, Berger King, KFC, Popeyes and the local Turkish food. Pretty good food and inexpensive. A giant Turkish pizza with 2 Cokes was 23 lira, about US 4.50 and Turkish tea is 1 lira. Very big mall with many shops, which facilitates your work if you are out for shopping for different kinds of goods. However parking is almost always a problem. The outside parking is usually full. There is a huge underground parking area, which lacks sufficient signage and in which one can get lost easily. A huge mall with a lot in it. But it was really the theater that stood out. It was very nice and seeing Mortal Engines in the IMAX was well worth it. The mall has a lot of nice shops and in truth, is basically like walking into a massive mall in the United States. You get exactly what you expect, but it is huge and that was cool. They also have a peaceful prayer room easy to access. Tgis place has everthing you need. However it gets crowded as the hallways are a bit narrow. As for their supermarket in the lower floor, you wish you were living in the area as it is huge and has fabulous sales.